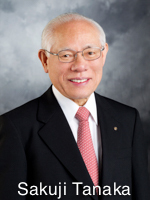 Sakuji Tanaka, a member of the Rotary Club of Yashio, Saitama, Japan, was RI President 2012-13. His theme was Peace Through Service, which emphasized peace as one of the Rotary's major avenues of service. He held Peace Forums in Berlin, Honolulu and Hiroshima, which served as the inspiration for this peace conference. Sakuji is an honorary member of the peace e-club of D5000 Hawaii (We Rotary) coordinator of Tract M, Rotary Creating Peace Internationally. Sakuji established an endowed Rotary Peace Fellowship, and he and his wife, Kyoko, are Paul Harris Fellows, Benefactors of the Permanent Fund, Major Donors and members of the Arch Klumph Society. He is a recipient of RI’s Service Above Self Award and The Rotary Foundation’s Distinguished Service Award and Citation for Meritorious Service. He is the 2014-18 Trustee of the Rotary Foundation. Tanaka and Kyoko have three children and seven grandchildren.